Ocean Beach has always been a fantastic place to hangout especially when you have a craving to grab one of the world’s greatest burgers at Hodad’s! The food is so satisfying, even celebrity chef, Guy Fieri stopped by to host the show, “Diners, Drive-Ins and Dives” at Hodad’s. According to the the website, a “hodad” is a nonsurfer who spends time at beaches masquerading as a surfer. Which explains why their one-of-a-kind burgers are served in a vibrant beach atmosphere! If you decide to try Hodad’s come hungry, but be prepared to wait especially if it’s a weekend! Hodad’s usually has a line out the door. Their menu is simple, but perfected: burgers, fries, onion rings, and shakes. Choose the size of your burger, choose your toppings, choose your side, and choose something to wash it all down with! You’ll never choose another burger joint once you’ve had a taste of the famous Hodad’s! In a small bowl, add mayonnaise, mustard, honey, vinegar, and 1 teaspoon pepper and whisk until smooth and combined. Sprinkle both sides of chicken with salt and remaining ½ teaspoon pepper. Place chicken breasts on preheated grill over medium heat. Top each breast with 1tablespoon dressing. Cook, 7 minutes. Flip and brush on another tablespoon of sauce per breast. Continue cooking until chicken is cooked through, 7 minutes. Divide salad greens between two large bowls. 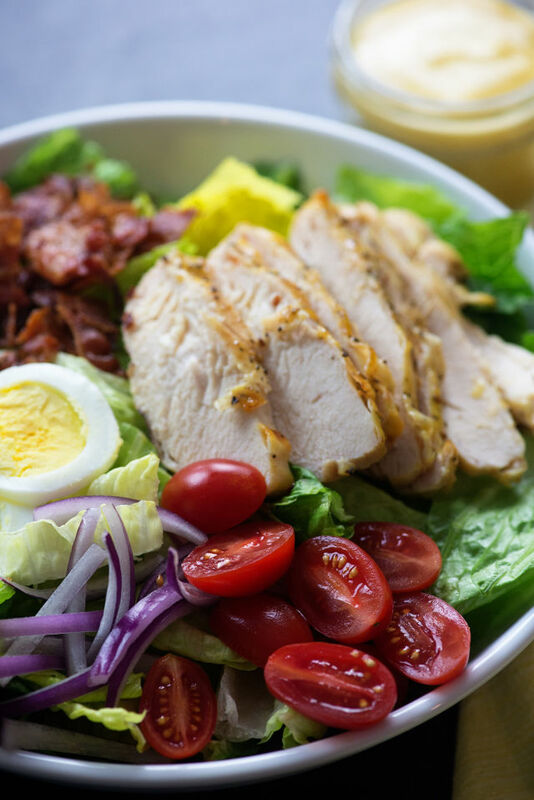 Top each salad with half bacon,tomatoes, onion, and eggs. Slice chicken into strips and place over salad. Serve with extra honey mustard dressing. Amy Green recently traveled to Hawaii where she tasted this delicious cake from Kalaheo Coffee Co. Now you can enjoy a little taste of Hawaii in your own home! Amy declares this one of the best cakes she's ever had! Follow directions on the cake mix for a 9 or 10 inch cake. Blend cream cheese until smooth. Add in 1/2 cup of the sugar and zest of the lemon. Remove mixture from bowl and chill slightly. Clean bowl and whip cream on high until soft peaks form. Add remaining sugar and vanilla to the cream and whip until very firm peaks. Fold half of the whipped cream into the cream cheese mixture. Fold in the balance of the whipped cream and add lemon juice to taste. Be careful not to get the mixture too soft. Place into refrigerator to cool and set up. 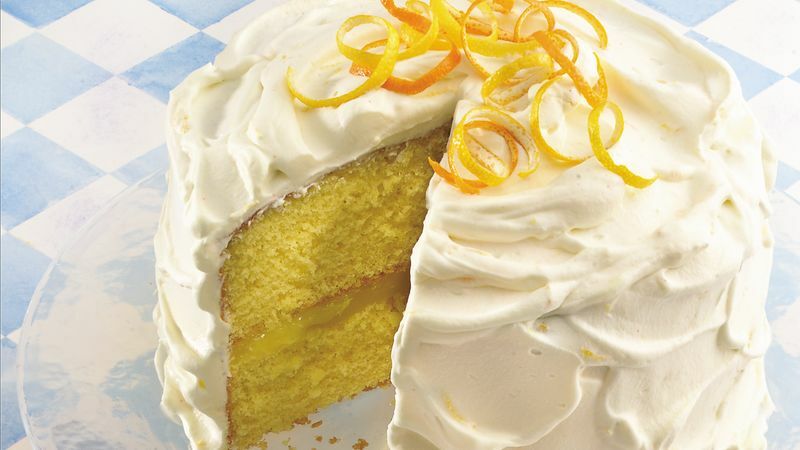 Once cake is cooled, ice the cake, add lemon zest on top of the cake for decoration, and enjoy! Light a grill or preheat a grill pan. Brush the apricots with oil and season with salt and pepper. Grill over high heat, cut sides down, just until lightly charred, 5 minutes. Let cool. In a bowl, whisk the lemon juice with the 1/4 cup of oil and season with salt and pepper. Gently toss in the apricots, radicchio and arugula. 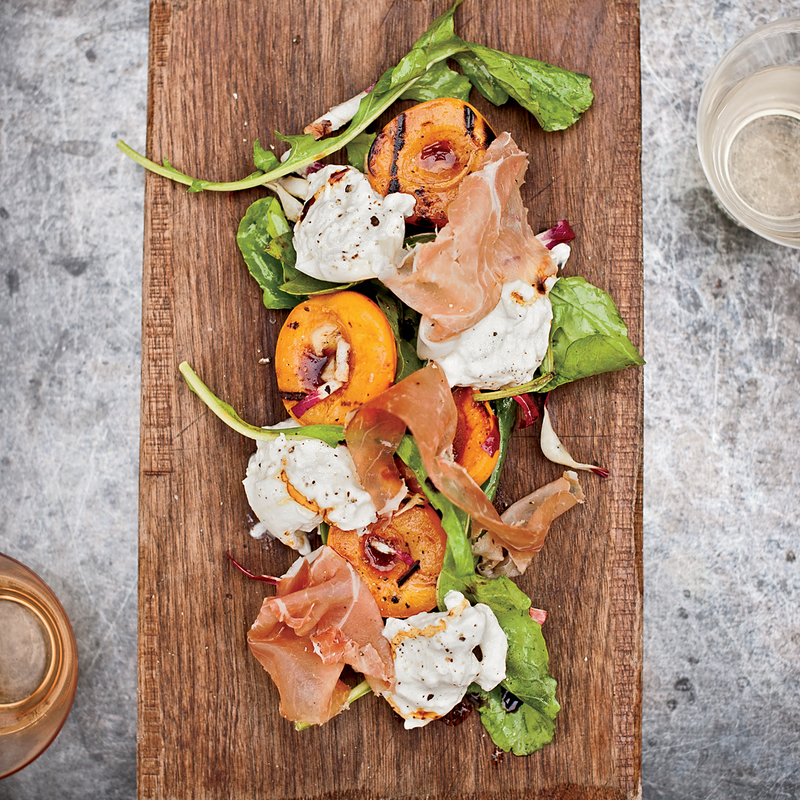 Transfer to a platter and top with the burrata, ham and vinegar. Serve. In a medium bowl, combine the olive oil with the chives, parsley, mint, lemon zest, lemon juice and garlic and season with salt. Let the salsa verde stand at room temperature for 15 minutes to 1 hour. Meanwhile, in a large saucepan, cover the potatoes with cold water, add a large pinch of salt and bring to a boil. Cook the potatoes over moderately high heat until just tender, about 8 minutes; drain and return them to the saucepan. Add 1 tablespoon of the butter and toss to coat. Season with salt. Bring a large pot of salted water to a boil. Add the beans and cook until crisp-tender, 4 minutes; drain. Return the beans to the pot and stir in the remaining 1 tablespoon of butter. Season with salt. Add half of the salsa verde to the potatoes and half to the beans, stirring to coat. Transfer the beans to a serving bowl. Top with the potatoes, garnish with the chive blossoms and serve right away. Nestled in a small shopping center on the edge of Scripps Ranch, Todo's Sushi is one of the area's best kept secrets! A true hole-in-the-wall sushi joint, Todo's is a local favorite that turns out consistently delicious sushi. Open for both lunch and dinner, Todo's is known for their amazing rolls! We recommend bringing a few friends so you can sample several different rolls. Our favorites are the Shrimp Tempura Crunch Roll, Spider Roll, Langostino Crunch Roll, Star Wars Roll, Sensual Pleasure Roll, and Sweet Hawaiian Roll. If you sit at the bar, you'll get the opportunity to sample even more delicious food as the chefs will make sure your plate is never empty! Todo's also serves Japanese favorites like gyoza, yakitori, teriyaki, miso soup, and udon. For dessert, try the green tea tempura ice cream - you won't be disappointed. One of the best things about Todo's Sushi (besides the awesome food) is the discounts. Many of the rolls come with dine-in discounts of 50% off. And if you're picking up takeout, a 40% discount still applies to many of the rolls! Not only does Todo's have some of the best sushi in the Scripps Ranch area, it's also affordable! 1. Cook green beans and 1/2 teaspoon salt in boiling water to cover in a large saucepan until tender-crisp, 3 to 4 minutes; drain. Plunge into ice water to stop cooking process; drain and pat dry with paper towels. 2. Bring potatoes and cold water to cover to a boil in large saucepan over medium-high; reduce heat to medium-low, and simmer until just tender, about 20 minutes total. Drain and let cool 30 minutes. Slice potatoes into 1/4- to 1/2-inch rounds. 3. Gently toss together green beans, potatoes, bell pepper, red onions, and remaining 1/4 teaspoon salt in a large bowl. Add Lemon-Soy Vinaigrette, and gently toss to combine. Transfer mixture to a serving platter, and top with mint, almonds, and sesame seeds. Serve room temperature or chilled. Sizzling Pot King serves traditional Chinese cuisines in a unique way! Similar to Mongolian hotpot, you order your choices of meats, veggies, or spices. However instead of cooking your food in a broth, the servers bring you a small stone or metal pot filled with your requested ingredients. After the pot and the ingredients inside cool, you can add either Chinese rice noodles or rice to the hotpot to complete your delicious meal! The standard meat choices available are pork, beef, chicken, or fish. Vegetable options include onions, bean sprouts, chopped lettuce, or leaks. There are also special menu options such as duck, rabbit, lobster, or fishcakes, but all all of them are served in the same dry hotpot method of cooking. If you are looking for a new Asian restaurant to try, Sizzling Pot King is a must! This year, Easter falls on Sunday, April 16! If you’re looking to enjoy a delicious Easter Brunch at one of the many wonderful San Diego restaurants, this guide is for you! The Del Mar resort (located at the historic site of the former Stratford Inn and Hotel Del Mar) has been a beach-side staple of North County for decades. The resort’s Coastline Easter Brunch Buffet will be served on April 16 from 10 a.m. to 3 p.m.Make a reservation by calling 858-793-6460 or visit www.laubergedelmar.com. Celebrate Easter at The Prado located in the heart of Balboa Park. This year, Champagne Buffet Brunch will be served from 10 a.m. to 2:30 p.m. For more information visit their webpage. The Hotel Del Coronado’s Crown Room and oceanfront Ballroom will each host Champagne Brunch buffets on Easter Sunday, from 9 a.m. to 2:30 p.m. and 9 a.m. to 2 p.m., respectively, complete with live musical entertainment. Visit their website to make reservations. For 75 years, this seaside staple in La Jolla has been known for its incredible views and the pounding surf that creates dramatic displays outside the restaurant’s windows. On Easter Sunday, The Marine Room will serve its holiday brunch buffet from 10 a.m. to 4 p.m. To make a reservation visit their webpage. Celebrate Easter in San Diego at the Westgate Hotel where guests are invited to enjoy holiday fun and relaxation in Parisian style. The hotel will be full of Easter joy at its festive Easter Champagne brunch from 10 a.m to 3 p.m Visit their page to make a reservation. From 10:30 a.m. to 2 p.m., the US Grant will host its Easter Brunch Buffet. Entertainment includes photos with the Easter Bunny and live music. To make a reservation, visit their page. Enjoy brunch with an ocean view! Pacifica’s brunch includes classic items like Smoked Pork Shoulder Hash as well as Pacifica favorites like Ruby Red Tuna Tartare. Visit their website to make reservations. Dine dockside this Easter at the Lakehouse Hotel between 9:00 a.m and 3:00 p.m. The brunch buffet will include hand-carved meats, breakfast favorites, a chilled seafood display, and dessert bar. More information can be found here. Celebrate Easter Sunday with La Jolla’s best views and a very special brunch filled French Toast with Chino Farms strawberries, Cauliflower Rigatoni, Snapper Crudo, Baja Shrimp Omelet, Eggs Benedict with Meyer Lemon Hollandiase, and more. Visit their website to make a reservation. Celebrate Easter Sunday at Chandler's between 10:30 a.m to 2:30 p.m for a celebration fit for the whole family. Enjoy brunch classics, ocean views, face painting, an egg hunt, and photo ops with the Easter Bunny. Click here for more information! Celebrate Easter at The Grand Del Mar Resort from 10 a.m to 2 p.m with Chef de Cuisine Joshua Dorfner with everything from pre-round pick-me-ups to late-night cravings. He satisfies hungry diners with his delicious, approachable cuisine that keeps you coming back for more. To book a reservation click here! Enjoy Easter Brunch with your family at Oceanside's newest hot spot, 608. Book your reservations early to ensure a spot. Come celebrate Easter at the beautiful Inn at Rancho Santa Fe. The Inn is located on 21 acres of lush lawns, flowering gardens, and winding pathways that create a charming and tranquil atmosphere. Click here for more information on this elaborate brunch buffet that will occur from 10:00 a.m to 2:00 p.m. Celebrate Easter Sunday at Rancho Valenica's signature restaurant, Veladora from 10:00 a.m to 2:30 p.m. There is something for the entire family with their signature holiday brunch and a fresh batch of holiday activities. Click here for more information on this special event. 1.Bring a large pot of salted water to a boil. Add the fusilli and cook as the label directs. 2. Add the sugar snap peas and/or broccoli, carrots and bell pepper to the boiling water during the last 2 minutes of cooking. Reserve 1/2 cup cooking water, then drain the pasta and vegetables and return to the pot. 3. Meanwhile, heat the olive oil in a large skillet over medium heat. Add the garlic and cook until just golden, about 30 seconds. 4. Add the tomatoes, red pepper flakes and 1 teaspoon salt; cook until the tomatoes begin to wilt, about 2 minutes. Stir in 1/4 cup of the reserved cooking water. Pour the tomato mixture over the pasta and vegetables. Add the mint, parmesan and half the goat cheese and toss to combine. Season with salt.Divide the pasta among bowls. Top with the remaining goat cheese and drizzle with olive oil.